The recipe looks like it makes a thick chili. But, my hubby and I love a chili with a bit more liquid in it, so I added 2 cups of beef broth. I also added cumin, more cayenne pepper and chili powder then it calls for, 1 jalapeno (seeded) and we had leftover bacon so we added that too. After cooking on High for 4hrs, I served it over tortilla chips, and garnished with shredded cheese and sour cream…omnomnom!! 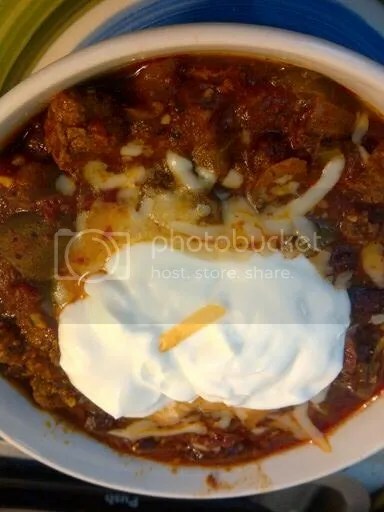 If you’re a lover of chili, I’d recommend this recipe. If you liked it as much as we did, I’m sure you’ll add it to your repotoire too.